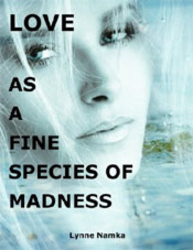 Love As a Fine Species of Madness tells about the soul-searching portrait of Janie Perkins who obsessively sorts through her haunting childhood memories to solve a long-hidden family murder. Janie, a vulnerable woman with grit and determination builds her life around, and then runs from, flawed men. This poignant psychological mystery has themes of loss, holding onto the first love across a lifetime and healing. This is bittersweet story of moving through the illusions of a never-to-be romance and finding an identity and place in the world. It is a life-affirming story of parental insanity, betrayal and redemption. So give yourself to love.